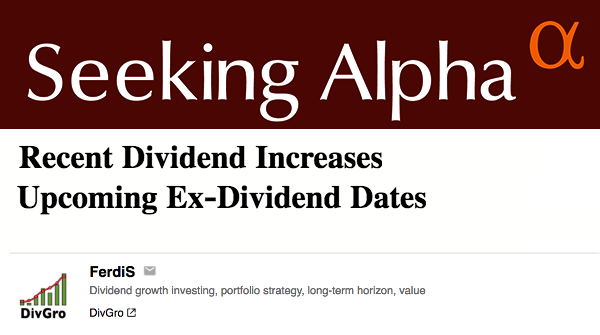 In the heat of earnings season, I often split these dividend increase announcement articles into two or more parts. Last week, 30 companies in the CCC List announced dividend increases. I own stock of four of these companies! In Part 1, I covered dividend increases announced for stocks in the Industrials and Financials sectors. Part 2 covers dividend increases from stocks in the remaining sectors. I like monitoring dividend increases for stocks in the CCC list because it allows me to identify candidates for further analysis. The top increase is from Nexstar Media (NXST), a television broadcasting and digital media company founded in 1996 and headquartered in Irving, Texas. NXST announced an impressive increase of 20% and now yields 2.14% at $83.62 per share.